While at Hot Studio I led, along with a senior content strategist, the research and design effort for SRI's website redesign initiative. We began by interviewing stakeholders and leadership, which revealed a very disjointed, siloed work environment which was manifest on the website. Only by talking with their customers were we able to persuade the SRI team that the if we were to transform the website into a seamless unified marketing site, we would need more cooperation from the different research sectors within SRI. The resulting site reconciled the ways that customers wanted to find information (by theme or topic) while keeping the various strengths of SRI at the forefront. We did this through improved navigation, better storytelling, a multi-faceted taxonomy, and cross-linking between disciplines and their respective project work. We interviewed multiple customers across different roles to determine their needs and the gaps in different phases of their experiences: when learning about SRI, while engaging with them, and after committing to working with them. We developed a series of segmentation task grids that identified their big concerns and questions. While they had different roles, it was rare that they didn't have the same general needs and questions. We conducted a content inventory and then organized into major themes. These organizational models we crafted to test supporting user needs while exposing their strengths and telling their brand story. We came up with two models, one of which was selected for the site architecture. We developed a framework of how to speak to different audiences and at what points in their engagement. SRI has a rich library of highly valuable and dense research, but not everyone needed that content at each step in their relationship. We helped craft sample copy and how to use it on different site pages in a methodological and replicable way. 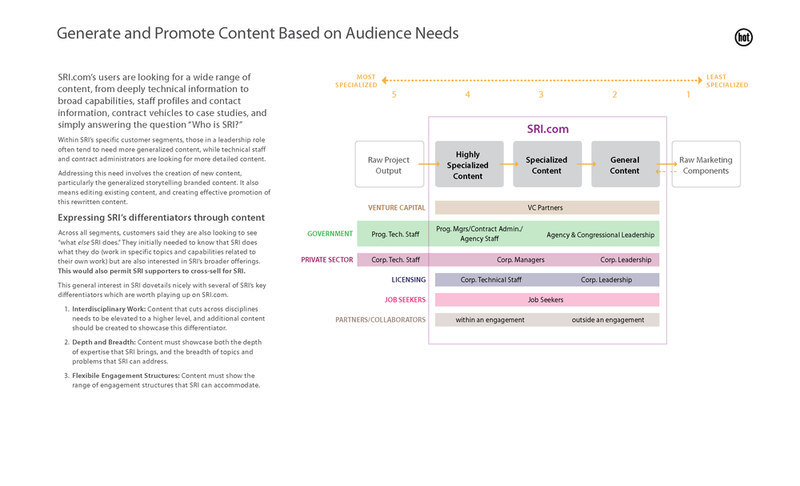 The wireframes included how the screen content and features addressed both our strategic recommendations for SRI as well as the needs of their audiences.